Last weekend, while J was at a “Mantreat” with his brothers, I had time to go to The Frick Collection. I really loved going to this collection for a lot of reasons, particularly because I’m loving more and more the experience of visiting a personal collection instead of going to a museum. When visiting a collection, there usually isn’t really an “exhibition thesis” or message that the curator is trying to jam down your throat. Instead, you can simply enjoy the works and aesthetic that the collector itself enjoyed. It’s so nice. I feel like I can just focus on artistic aesthetic and beauty, instead of analyzing and historicizing. Although museums and exhibition theses have their virtues, sometimes it’s nice to just appreciate art for it’s beauty. 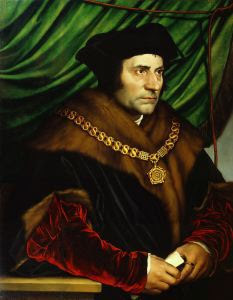 My biggest surprise when arriving at the Frick was seeing Holbein’s portrait of Sir Thomas More. I already was well familiar with this painting, but had never seen it in person. When I stood in front of it, I audibly gasped. There is such an energetic, vivacious quality in the red sleeves of More’s clothing – it was so gorgeous! The painting was so much more lively and animated than I had ever before thought (I have to admit, portraiture is not always my favorite type of art). I have included a reproduction which best “does justice” to the work and the glowing sleeves, but it still is a far cry from the actual work. The sleeves were only the beginning of my love affair with this painting. The fur trim is so soft in it’s depiction -it really is a great example of how oil painters used their medium “evasively.” This isn’t oil paint at all – this is fur! The cold, heavy gold chain around More’s neck (which also parades the strengths and capabilities of Holbein and oil paint, because it has such strikingly different qualities than the other textures in the work) makes the fur seem even softer by contrast. What a gemsticle of a work! I’ve always appreciated Northern Renaissance and Baroque art to a degree, but I think this is one of the first times that I really had a strong aesthetic experience. The bright oil colors were just too gorgeous to be overlooked. Way to go, Holbein. For the past week or so, I have been madly trying to research for my thesis topic before we leave for Brazil. I know that I’ll be able to ILL a lot of the books that are in the archives of the NYPL, but it just seems to make sense to look at them while I’m here. And things have been going well, sort of. Today I ran into a couple of walls which really have made me need to decide how much conviction I have in my argument. I still believe that my argument can be supported, don’t get me wrong, but I sometimes feel like I’m paddling upstream. I wish there were more 18th century documents available from obscure areas of colonial Brazil. I wish that there was some definitive proof that my artist is not more than a legend. (I still think that the (two?) extant documents and baptismal certificate are enough, but it makes me falter when I see scholars in the field expressing doubts.) More than anything, I wish that some of Aleijadiho’s contemporaries would have taken the time to write about him. That’s most frustrating (and most disconcerting). All of the contemporary documents that supposedly mention Aleijadinho have been “lost” over time. Great. 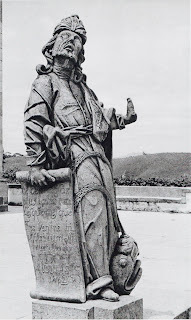 I am now writing about a legendary artist and supporting my argument with a semi-mythic figure. This will go over well at my defense. I am realizing now how thesis conviction really is important. I really think that my argument can be supported, and I need to stand up against some of these odds. At least I feel like I can still think critically.